Motorists zipping through Minneapolis will need to plan for a longer commute this weekend when Interstate 35W shuts down. The freeway will close in both directions between Interstate 94 and Minnesota Highway 62 from 10 p.m. Friday until 5 a.m. Monday. Southbound I-35W will be open at 46th Street. And while this isn't a full closure, it's worth noting because it could cause delays: Interstate 35 just north and south of Minnesota 97 in the north metro will close from 7 p.m. Friday until 5 a.m. Monday. Traffic will detour up and down the ramps at Highway 97. 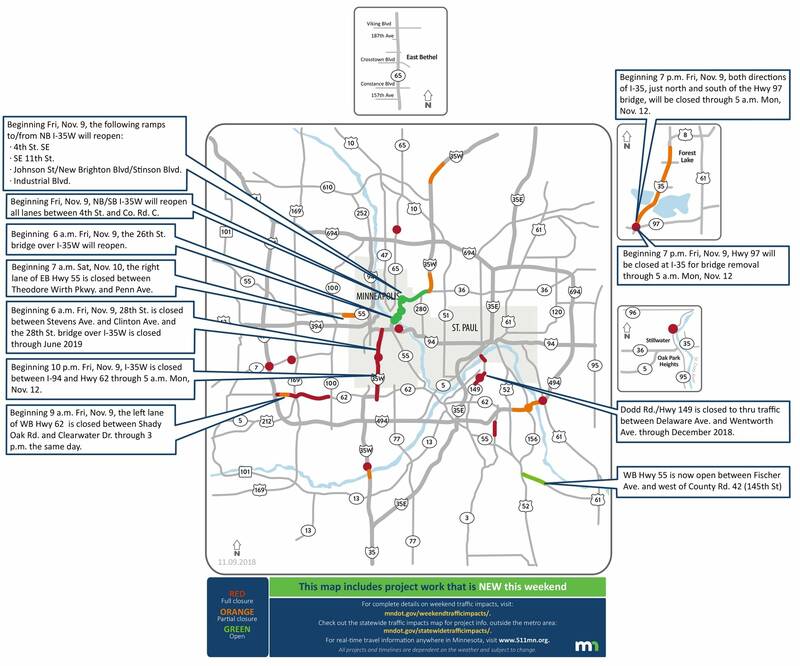 Check out the rest of the Minnesota Department of Transportation's weekend traffic hassle map here.